The Resident Evil series has been going strong since the first game debuted back in 1996, and the franchise has offered great survival-horror gameplay over the years, no doubt. And it’s testament to the popularity of the series that Capcom has been releasing remasters of the Resident Evil games over the years, with games like the 1996 original and Resident Evil Zero getting the remaster treatment, while the much-loved Resident Evil 2 will be getting a remastered edition soon too. And the latest game in Capcom’s renowned horror series to be released in remastered form is Resident Evil: Revelations, a game which originally debuted on the Nintendo 3DS back in 2012. Revelations later made it to other platforms like the Xbox 360, PS3 and Wii U, and now it’s finally available for both the Xbox One and PS4. This edition of the game features reworked, high-definition textures, plus all the DLC items released for the game feature here as in-game rewards, while the controls and user interface have been given a makeover too. When first diving into the game, you’ll notice this plays like all other Resident Evil games, with the action being seen from a third-person perspective. The controls will be familiar to anyone who has played a third-person action game on consoles before (the gamepad’s left trigger is used to aim and the right to shoot, the X button is used to interact with objects in the world and so on), while the user interface is on a par with that of modern console games too. 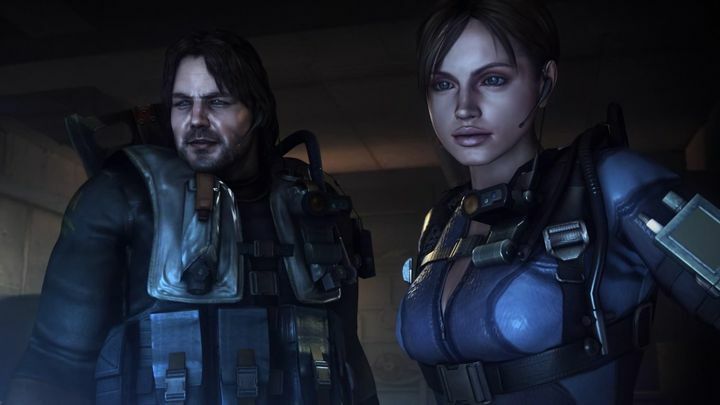 The game’s story is told through pretty high-definition cutscenes such as this one. 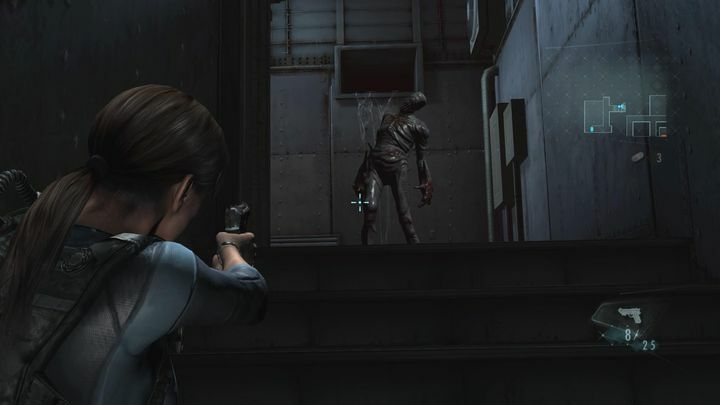 Resident Evil Revelations’ graphics also look pretty good by today’s standards, although some low-res, flat textures and a few blocky objects throughout betray the game’s 3DS roots. So, despite the fact this is a remaster of a 3DS game, its controls and looks are comparable to those of modern games on consoles these days, so kudos to Capcom for getting these aspects of the remaster right. Also, Resident Evil: Revelations’ cutscenes do look superb in high-definition, and there are some pretty stunning ones throughout the game, such as one in which a city in the middle of the ocean is blasted to oblivion by a satellite in space. There are quite a few cinematic cutscenes throughout the game, and most are well-produced, helping advance the somewhat convoluted plot. This is divided into 12 episodes, and each ends in a cliffhanger, keeping you on the edge of your seat and with a desire to find out what happens next. That being said, those new to Resident Evil might find the plot a bit convoluted as there are plenty of acronyms tossed at you throughout the story like BSAA (the zombie-hunting organization the game’s protagonist is a member of), the FBC and a sinister terrorist group named Veltro, which has a deadly plan involving the T-virus and the world’s oceans… Nonetheless, the story is fun to follow, and does pack in a surprise or two. The fact that the game is structured episodically will be great for casual players too, as each episode is not that long. Actually, only a few took me more than an hour to finish, but some of the later ones can be played through in less than 5 minutes. Also, an introductory video plays before each episode, providing a summary of previous events, which is great is you get back to the game after not having played for a while. And thankfully these videos can be skipped if you are playing the game more continuously, although the single player campaign is not that long and only took me about 8 hours to finish. Another interesting thing about Resident Evil: Revelations’ plot is that it plays out from the point of view of several characters. 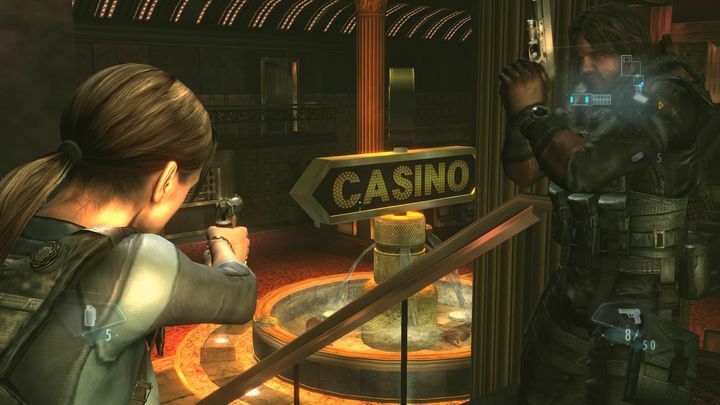 Things begin with the duo of Jill Valentine and her BSAA colleague Parker, but you later get to play as Resident Evil stalwart Chris Redfield too, and also as a pair of operatives in military uniforms belonging to zombie-hunting organization BSAA, who help provide comic relief at some points in Revelations story. It’s a pity, though, that playing as one character or another doesn’t really have any effect on gameplay, as they all handle the same. At least there’s a variety of weapons to play with, though. These include the typical pistols, machine guns and shotguns, although you also get a sniper rifle and rocket launcher in the game’s later stages. Sadly, most of these weapons don’t sound as punchy as I would have liked, but thankfully most are fun to use throughout the game. Aside from the weapons, you also get a nifty little tool known as the Genesis in this game. This can be used to scan the bodies of dead enemies, which nets you herbs. Also, you can scan the game’s various locations for hidden goodies such as ammo using the Genesis, and look for hidden handprints (an optional activity in Revelations) with it too. Sometimes using the Genesis is necessary to progress in the game, though. This is the case in one level in which it’s needed to uncover the location of a critical mission item, and also in a later stage in order to make your way through hidden laser barriers. And no doubt using the Genesis is a fun activity in the game, and surely one of the joys of playing through this Resident Evil: Revelations remaster. 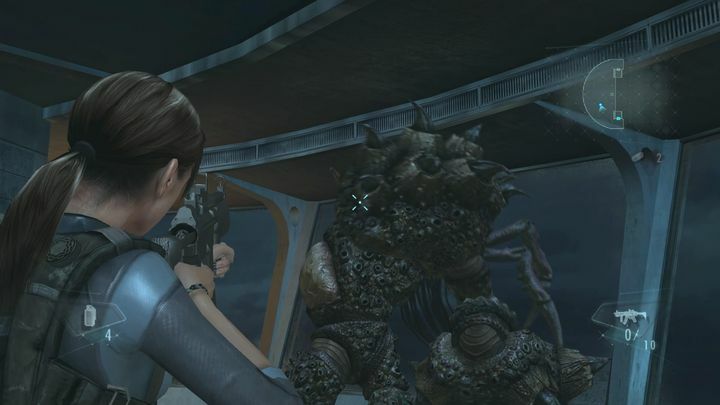 Intense and scary boss fights abound in Resident Evil: Revelations. The game’s campaign takes place in a variety of interesting locations. These include a desolate beach, a snowy mountain valley, an FBC installation and, of course, the Queen Zenobia, where most of the game’s action takes place. This is a derelict ocean liner which is at the centre of the game’s conspiracy-ridden plot, and a great location too. Actually, the ship’s tight corridors and cabins are quite atmospheric, plus there are also a variety of locations within the ship itself, including luxury dining rooms, what looks like an opera hall and a casino too. The casino in particular is a great location, it’s bright, colourful palette contrasting with the dark hues of the ship’s corridors and cabins. You can also find more information about the Queen Zenobia and other in-game events by reading documents scattered throughout the game (and on one occasion reading one of these is actually required to progress in the game), which is a fun way to take a break from all the shooting. 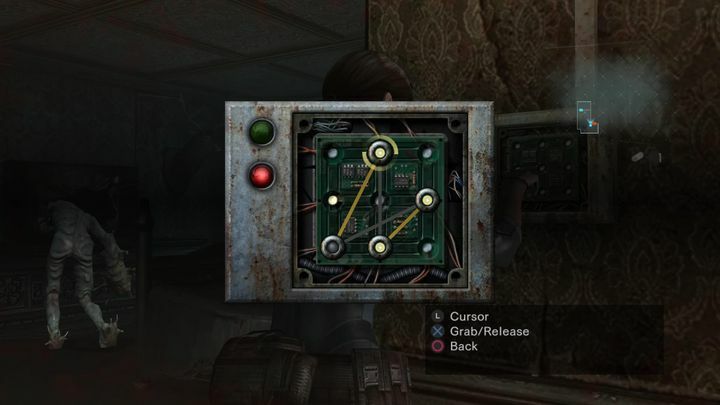 There are also a few puzzles to solve throughout the campaign, including a series of entertaining ones which offer a variation of the old connect the dots mini-game. Of course, the shooting is the main course here, and thankfully there’s quite a menagerie of scary enemies to deal with in Revelations. These include ones obviously inspired by underwater creatures which you find aboard the Queen Zenobia (and which some may notice look a bit like Davy Jones’ crew in the Pirates of the Caribbean: Dead Man’s Chest movie). Some enemies have oversized arms full of spikes, while others can hurl projectiles at you. There are also enemies which explode when shot and can take out their hapless comrades with them (and it sure is fun to time your shots in order to achieve this). Others, like an armoured brute which can shield itself from your bullets appear in the later stages, and are harder to take down. Aside from these, the typical Resident Evil zombie dogs also show up in Revelations, and reptile-like enemies (which are referred to in-game as B.O.Ws) are also prevalent throughout the game. It’s not all shooting in Resident Evil: Revelations, as there are some entertaining puzzle-like games for you to play during the campaign. These enemies are quite scary and fitting for a survival-horror game such as this one, even if the enemy AI is not particularly bright here. Enemies make up for this with their powerful attacks which can drain your energy fast, and by attacking in groups. Actually, some end of level encounters involve fighting hordes of enemies. And Revelations being true to Resident Evil’s survival-horror roots, you may find yourself running out of ammo at some points in the game. Of course, the game’s big boss fights are also a highlight, and there are quite a few of these throughout the game. There’s one memorable encounter involving a grotesque zombie creature which is perched on an elevator, with you having to avoid its attacks in the confined space of the elevator. The creature’s massive size is revealed in the second stage of this fight, the key here being to learn to avoid its charges, while hitting the vulnerable spots in its body. In this and Revelations’ other boss fights, learning the enemy’s attack patterns and behaviour is necessary to succeed. Sadly, though, the final boss fight is disappointing, as it features an annoying teleporting enemy that requires more luck than skill to defeat. Throughout all these encounters, you may also wonder why your AI sidekick is incapable of taking out any enemies on his own, and just seems to be there to help deliver the plot. Actually, enemies almost always focused their attention on me. And it does not appear your sidekick can die in battle either, which is not very realistic either. Your character obviously does take damage when battling the game’s monstrous enemies, though, and this is represented by a blood splatter effect onscreen, with the game’s colour palette turning to shades of grey, and your character breathing heavily and crying in pain as death nears. Of course, you can get your health back by using herbs as is the norm in the Resident Evil games. Most of the time you have enough herbs in your inventory, meaning death and having to replay stages again is not such a common occurrence during the campaign. Thankfully, though, the game has an autosave feature, with save points being evenly space throughout, and you can also save between chapters. The Queen Zenobia ship has seen better days, no doubt. When you are done with the campaign, there’s also Raid mode to plough through. This is an arcade mode which ditches the story, and in which you fight variants of enemies you tackled in the campaign. This can be played cooperatively with another player online or solo, and Raid mode’s various stages (the same levels you play through in the campaign) are unlocked as you complete the campaign’s episodes. Raid mode is quite entertaining, and could keep you busy for some time if you can team up with a friend for some cooperative play. It’s not so thrilling going at it alone though, even if being able to play as different characters and unlock weapons as you progress does add somewhat to Raid mode’s appeal. So, should Resident Evil fans pick up this Revelations remaster? The answer is most definitely yes if you’ve never played this Resident Evil game, as the story and action are strong enough to warrant shelling out the asking price for this remaster. If you’ve already played through Revelations though, then there’s little new here except a fresh coat of paint and refined controls. Although clearly die-hard Resident Evil fans might still want to add this to their collection in order to enjoy an updated edition of what clearly is a solid entry in the long-running survival-horror franchise.